To use the plugin, copy MSU_FRC.dll file to "plugins" directory in AviSynth install folder or use the function LoadPlugin directly from the script. The input video must be in YV12 colorspace. To convert a video into YV12 colorspace use ConvertToYV12. The width and the height of the input video must be multiples of 16. To resize a video use Crop and/or AddBorders. Test sequence "matrix". Interpolation factor is 4, slow preset. The figure below demonstrates the results of the objective comparison. The objective quality of processed sequences for various methods was measured using Y-PSNR. During PSNR calculation only interpolated frames were used. In order to do so the original video sequences were first decimated with factor 2 and then decimated frames were interpolated using FRC. After that the interpolated frames were compared with the original ones using Y-PSNR metric. 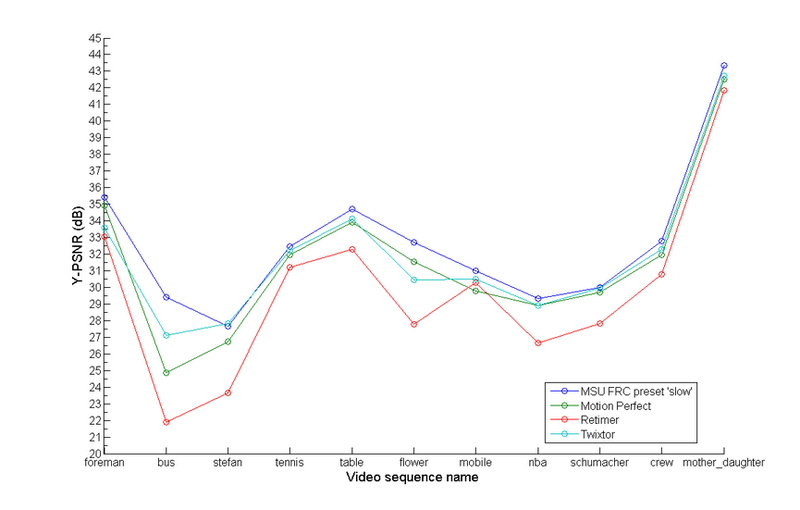 Vertical axis is marked by average Y-PSNR values for each sequence, the horizontal one - by the names of test video sequences. It can be seen that the developed algorithm shows the best objective quality on most sequences.